A Paleo Summary for Endurance Athletes…. As homo sapiens, we are genetically adapted to a hunter gatherer diet. The introduction of domesticated animals, agriculture, and processed foods are very recent developments in the scope of evolutionary history. As such, our bodies are not adapted to a diet derived from these technological development. A proper homo sapien diet replicates the diet of our hunter-gatherer ancestors. Dr Condain says that we are genetically suited for this diet. However, our ancient ancestors seldom did 2 hour runs and 6 hour bikes. Certainly, they had periods of intense activity, but these where relatively brief and spaced apart. This diet is not well-suited to the needs of endurance athletes: to fuel optimum performance and recovery, so the activity can be repeated after a relatively short time, again and again. Dr Cordain recognized this in his presentation. In fact, he and Joe are working on a book that will adapt the ideas of the Paleo Diet to the needs of endurance athletes. This is where Gordo’s ideas are particularly valuable. He has begun to apply the Paleo Diet and has modified it to serve the unique requirements of endurance athletes. Majority of nutrition from whole fruits, lean protein and fresh veggies. Starch and sugar only during and after training. Eliminate as much processed food as possible. #2 is the break from the strict Paleo Diet, in order to satisfy the need to quickly replace glycogen stores after exercise. This ensures the athlete is ready to repeat the activity within a relatively short time. Focus on achieving an optimal body composition that is a good balance between performance and recovery. Make good food choices rather than avoid foods. Make a plan, and measure it with the Geekometer. Do the best you can to follow your plan, not beating yourself if you stumble from time to time. Get the majority of your nutrition from whole fruits, lean protein and fresh veggies. Limit starch and sugar to during and after training. Ang is definitely a Paleo Athlete! Does a ‘6 pack’ prevent back pain? I read once that only 5% of the population have the ability to attain a true and visible ‘6 pack’ of muscle in the abdominal core, irrespective of diet and training. I am glad that I am not one of that 5%. I don’t feel the pressure to keep something I don’t have so it then affords me the luxury of a glass or 5 of tasty carbohydrate laden Australian cool climate Shiraz every night. Attaining the ‘6 pack’ of muscle in the abdominal core is a fine balance between genetics, good nutrition (often the low carbohydrate variety espoused by the bodybuilders and fitness competitors) and good training. But does a ‘6 pack’ guard against the dreaded modern day curse of low back pain.? Well I would argue that in fact it may, for a whole bunch of reasons. Firstly, in order to have the much sought after ‘6 pack’, you need extraordinary low body fat levels. Interestingly, one of the biggest predictors of low back pain is in fact obesity. Generally people who carry too much weight place too much stress on their low backs in bending due to the extra leverage that the upper torso places on the spine. Clearly, those with a ‘6 pack’ don’t carry any unnecessary baggage to place stress on their spines. Furthermore, research shows that in the treatment of chronic low back pain, moderate exercise can sometimes be as effective as countless hours of physiotherapy and chiropractic work. Why? Because when you increase from being sedentary to slightly active, you immediately start to use and recruit dormant muscles particularly the ‘core stabilisers’. One would argue that you could directly measure the inner unit (or inner core) muscles of someone who sports a ‘6 pack’ and chances are the muscles will be reasonably functional. It’s because they use these muscles in all the movement that they do. Those with a ‘6 pack’ generally also have above levels of flexibility. They are training machines who cover all bases including regular stretching. And what we physio’s know is that if you have flexion based back pain – the type caused or exacerbated by forward bending or prolonged sitting – then by stretching your hamstrings and gluteals your back pain should diminish somewhat. Lastly, those with a ‘6 pack’ actually train their low back muscles and abdominal muscles. There is a lot of truth in the notion that some ‘abdominal’ training exercises place enormous and dangerous strains and pressures on the discs in the low back. For example, the abdominal curl machine (the one you sit on and have a roller against your chest and you ‘crunch’ to bring the roller to your knees) will place massive compressive pressure on the disc and potentially cause a low back injury. But the ‘6 pack’ holders generally don’t do these exercises. No they are the clever ones who do controlled ‘floor crunches’ and ‘plank’ type exercises. They don’t need or choose to use these gimmick machines. Move. Do something as simple as walking, or better still walk in a pool. Train your abdominals in a smart and sensible manner. Patients with sleep symptoms are at higher risk for developing metabolic syndrome, a prospective study found. Difficulty falling asleep, snoring loudly, and unrefreshing sleep were significant predictors of metabolic syndrome (P<0.05). Snoring doubled the risk, while difficulty falling asleep increased the risk by 80%, Wendy Troxel, PhD, of the University of Pittsburgh, and colleagues reported in Sleep. Loud snoring also was associated with doubled risks of other metabolic abnormalities, and remained a significant metabolic syndrome predictor after further apnea-hypopnea index (AHI) adjustment, whereas other sleep symptoms were only marginally significant, the researchers noted. Explain that patients with sleep symptoms such as difficulty falling asleep, unrefreshing sleep, and loud snoring are at higher risk for developing metabolic syndrome. The study evaluated 2,000 patients enrolled in an ongoing, community-based prospective heart health study. Patients were ages 45 to 74, lived in or around the Pittsburgh metropolitan area, and had no comorbidity limiting life expectancy to less than five years. Exclusion criteria included non-black or non-white race, presence of metabolic syndrome or diabetes at baseline, and missing sleep or covariate data at baseline. The final sample included 812 patients, with a subset of 294 patients agreeing to undergo further evaluation at home in a follow-up analysis adjusted for AHI. The primary outcome was the presence or absence of metabolic syndrome at the three-year follow-up. Waist circumference, fasting glucose, and lipids were measured at baseline and annually for three years. Patients were given the Insomnia Sleep Questionnaire and the Multivariable Apnea Prediction Questionnaire to evaluate sleep-disordered breathing and insomnia symptoms. Covariate measures included history of smoking, alcohol consumption, physical activeness, and depressive symptoms. At the three year follow-up, 14% of patients developed metabolic syndrome. After adjustment for loud snoring, difficulty falling asleep remained a significant predictor (OR 1.78, 95% CI 1.05 to 3.02), while unrefreshing sleep showed marginal significance (OR 1.56, 95% CI 0.96 to 2.53). The significant symptoms also were compared against the AHI. Only loud snoring remained significant as a predictor (OR 3.01, 95% CI 1.39 to 6.55), while difficulty falling asleep was marginal (OR 1.91, 95% CI 0.80 to 4.58). Researchers noted the study was limited by self-reported sleep disturbance and lack of sleep duration measures. The AHI analysis was limited by small subsample size and the cross-sectional nature of the AHI assessment. Healthcare professionals should look for common sleep symptoms while assessing a patient due to the measured health risks associated with some symptoms, the researchers concluded, adding that future research could look at subjective sleep complaints and psychological factors affecting patients’ poor sleep related to cardiovascular morbidity and mortality. Do Cortisone Shots Actually Make Things Worse? Do Cortisone shots actually make things worse? This a great article taken from the New York Times…. The Top 5 Places For Inspiration…. Where & when do you get inspired? Without thinking about it, I would answer that my ideas come sporadically and randomly. But when I actually sat down to think about it, most of the best ideas I’ve had over the years have come in specific places or situations. 5. At 5am, drinking a cup of tea, in an a still, quiet and empty house before anyone else is up. Note to self… Keep this list and USE IT when “stuck” and in need of a breakthrough. What about you… where do you go for inspiration… and/or what do you do? 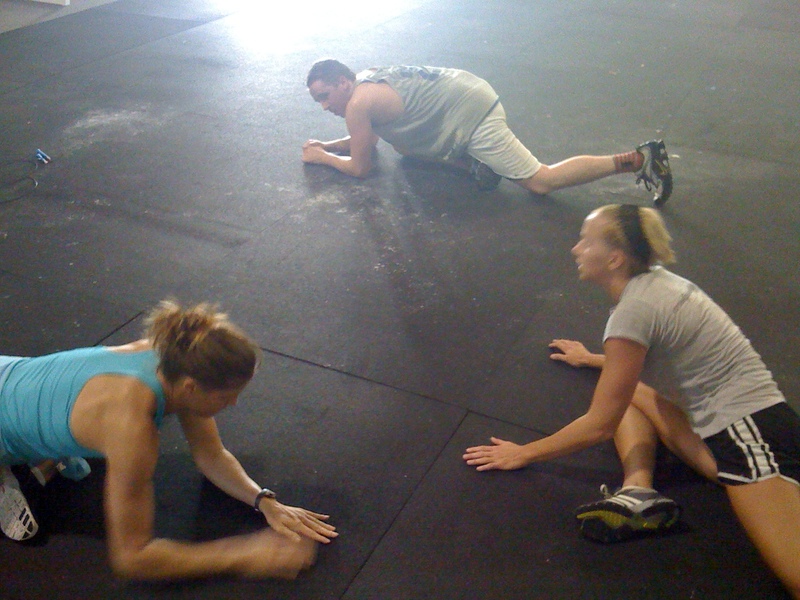 CrossFitters are always coming up with new and innovative ideas for working out …. so why not snow shoe for time? Here is a quick informative video from the people at Livestrong on the health benefits of snow shoeing. This is a tremendous article from the Washington Post on “Recovering from high intensity workouts”. Check it out and post your comments and thoughts as well…..
You are currently browsing the CrossFit Sioux Falls Endurance blog archives for December, 2010.